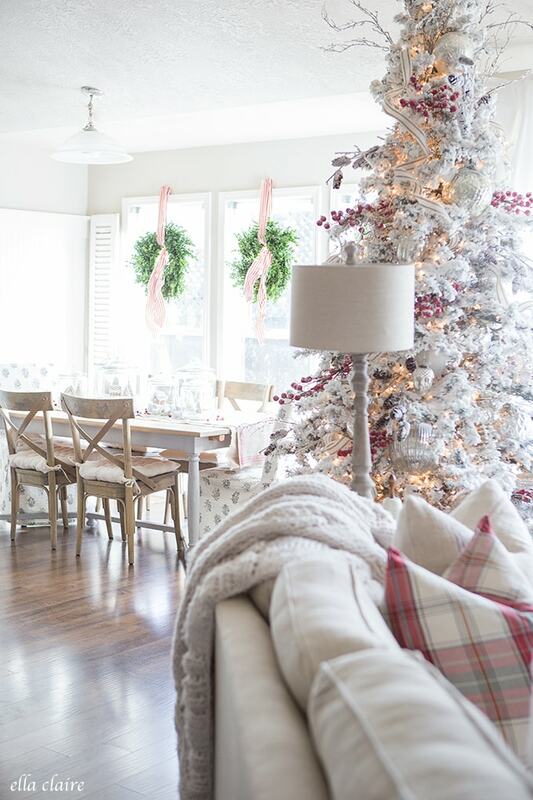 I am so excited to share my home all decorated for Christmas with you today as part of Jennifer Rizzo’s Holiday Housewalk. 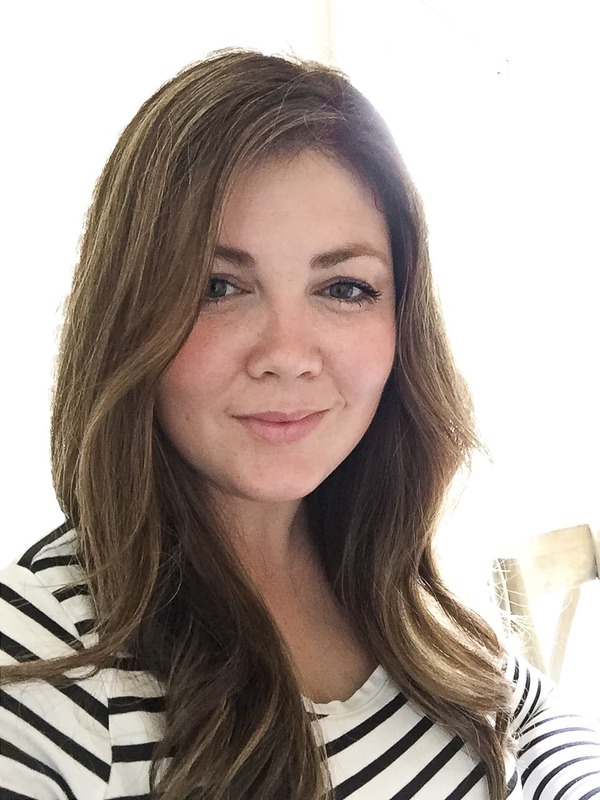 I love this day, and I am always so excited to participate and see what all of the other lovely participants have to share. If you are coming over from Tidbits, welcome! I hope you have enjoyed the tour so far. If you would like to start the tour from the beginning, you can head here.. Whenever I pull out my Christmas decorations, I always think that nothing will change from year to year, but it always does. 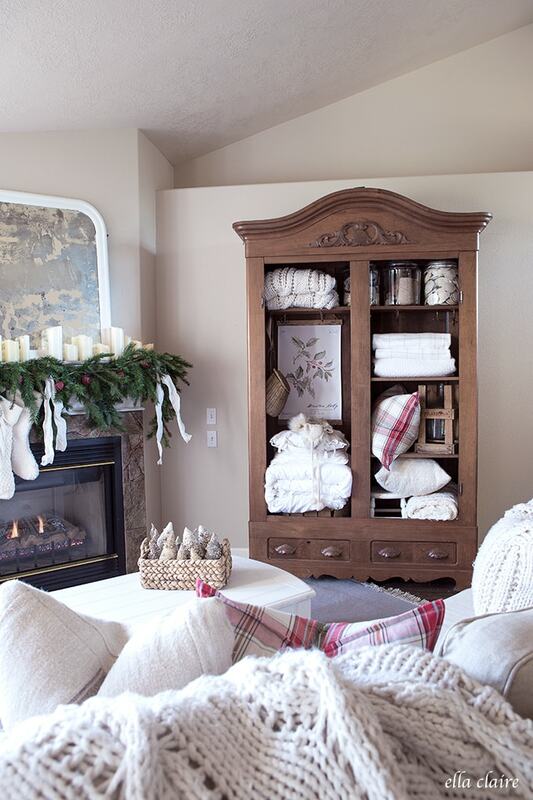 I tend to add and tweak all of the rooms in my home throughout the year as well as at Christmastime. I still love my flocked tree but this year she was looking a little worn down with patches of missing flocking. Plus, after a couple hours of trying to fix the lights, I finally had to give up and put new lights on her. When I was finished, I added more (real) flocking (tutorial here) and now she is as good as new. 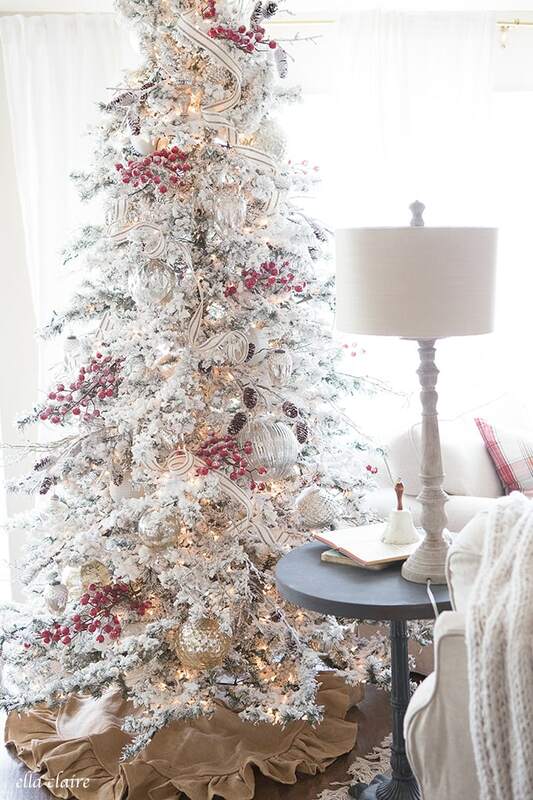 For tree sources, you can check out my post on how to decorate a Christmas tree HERE. For ribbon tips, see HERE. I also share how to flock a Christmas tree (the real way) HERE. 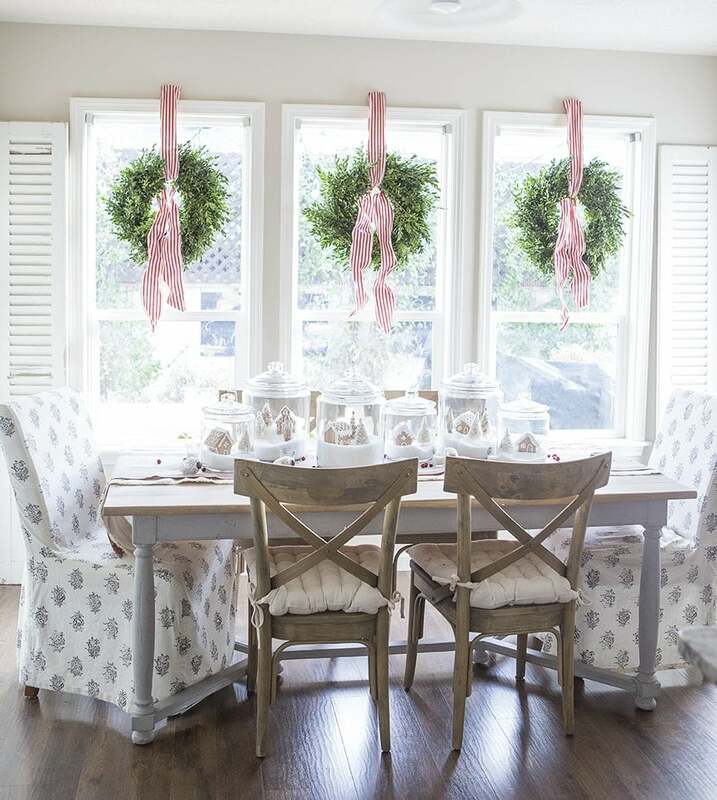 I look forward to buying my fresh boxwood wreaths from Trader Joe’s every year and used my favorite tried Christmas ribbon to hang them in my dining windows. 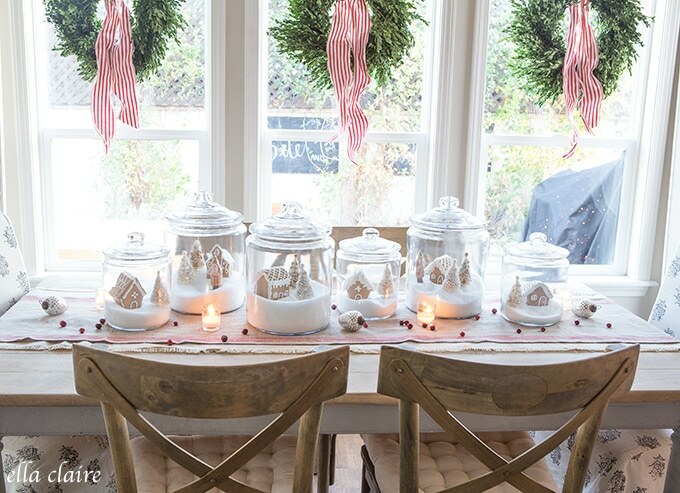 This is probably my favorite spot in our home right now (the tutorial for these Gingerbread village jars will be coming soon). It just feels so bright and Christmas happy to me. 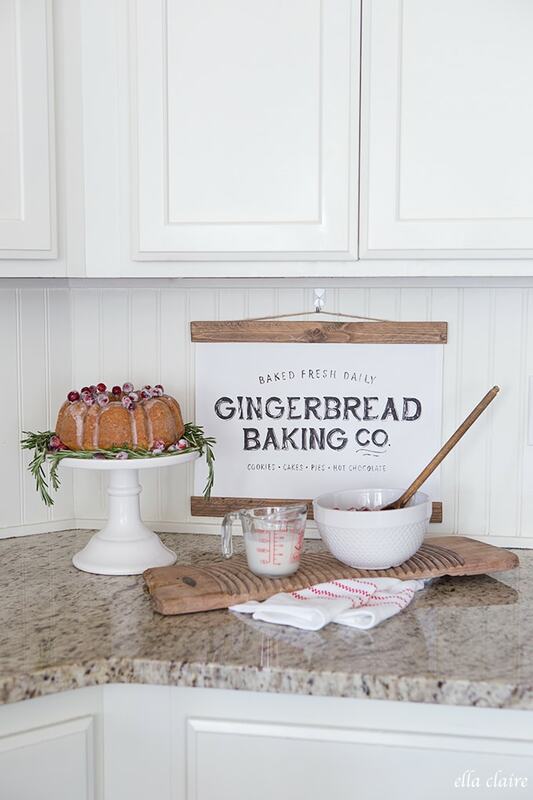 Our kitchen really is the heart of our home and we make many fun memories during the holidays baking Christmas cookies, decorating gingerbread houses and sipping hot cocoa together. 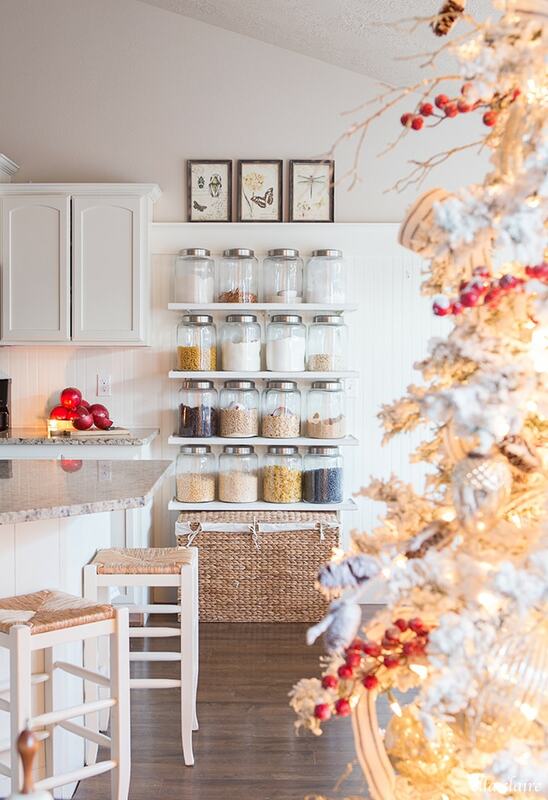 I love gathering my babies around, with all of our little aprons on, to whip up our Christmas goodies. I splurged on new stockings this year (from Pottery Barn). I had my eye on these varying ivory ones and love the mix of the different size and textures. I still have my stocking from when I was a little girl and I hope my kids have as many fond memories with theirs as I had with mine. 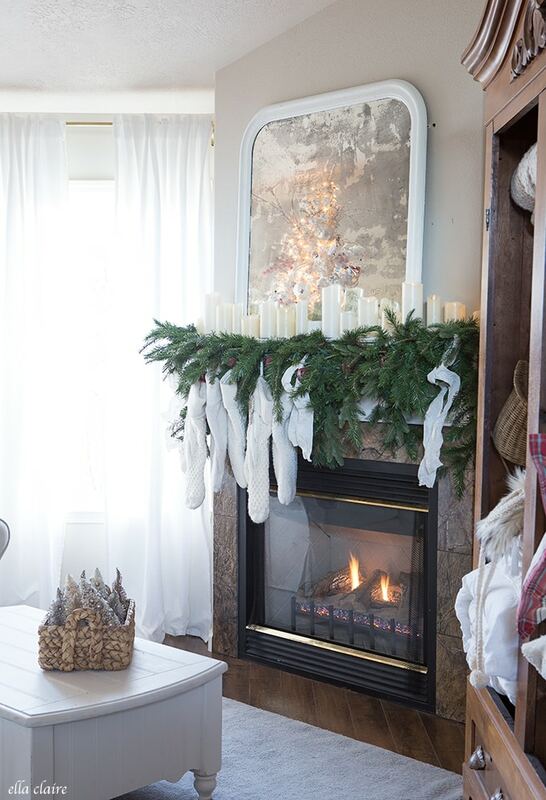 You can see more about my mantel here. 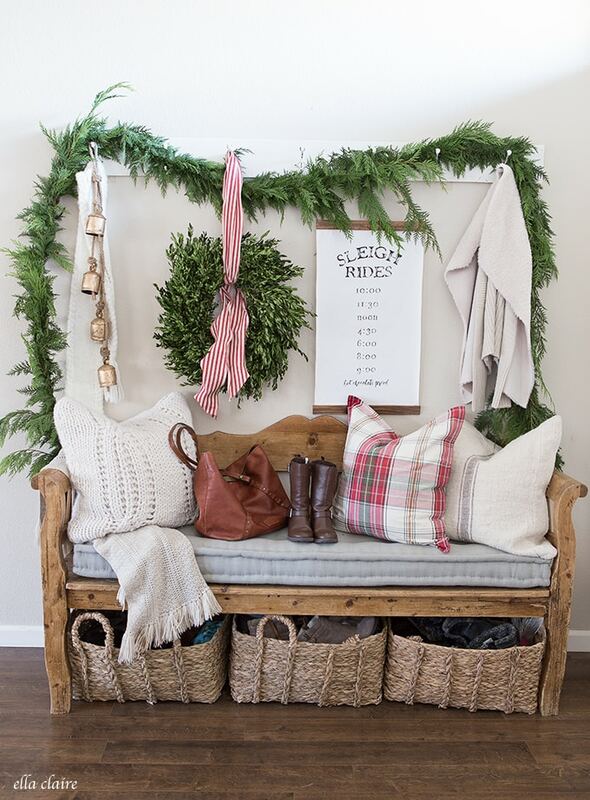 In our entryway, I draped live garland over my little DIY hook board that I whipped up a couple of days ago. I carried the same pillows into this space as well since it is all open to the family room. 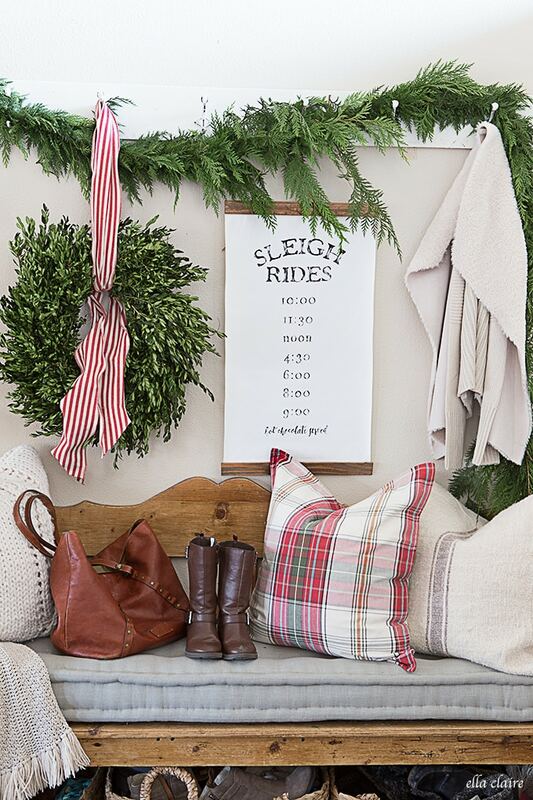 (Sleigh Rides wall hanging from my shop HERE) The scent of the fresh garland makes me so happy every time I come through the door. 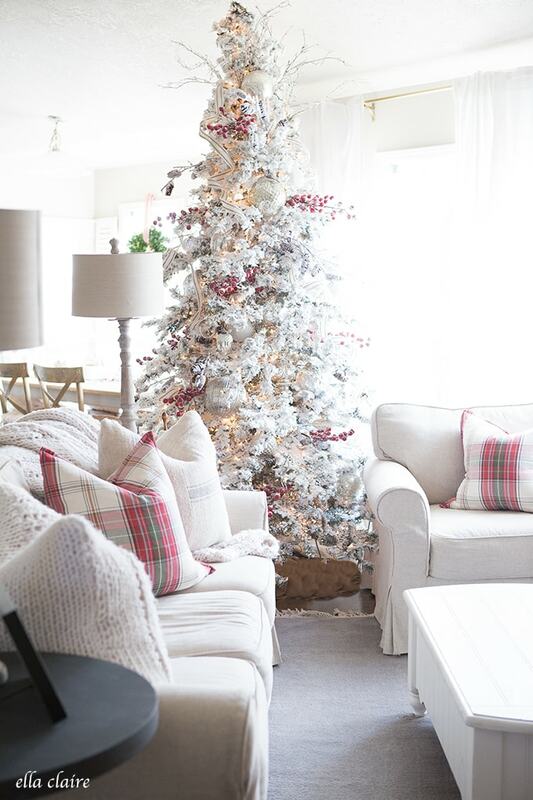 Wayfair sent me a fun new flocked Christmas tree for this post and I had such a fun time decorating it. I went with a vintage toy themed tree since it is in our playroom/ bonus room space and my kids LOVE it! Ella tells me all the time that it is her favorite tree. 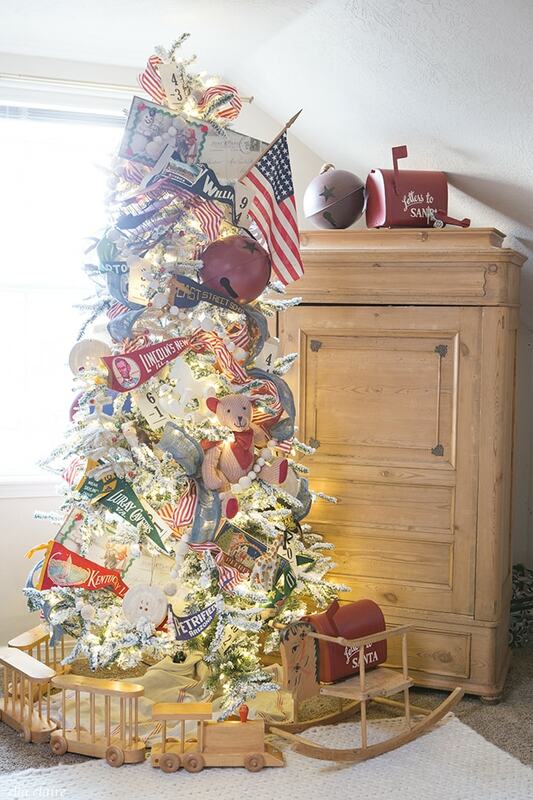 When I was a little girl, my favorite friend’s mom did a vintage toy tree every year and I always loved it. My friend started doing one in her home and I do one in mine. I think one of the things that makes Christmas so magical is the traditions and the memories associated with them. I am thankful for all of those special people who have dotted my life with those memories that I hold dear. I will try to do an additional post with all of the tree details as well. You can see my Christmas bedroom HERE. 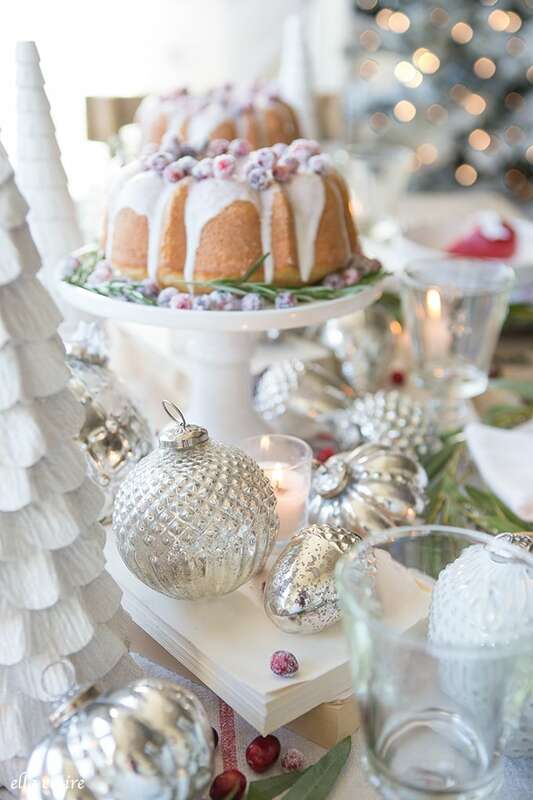 You can also see a fun Christmas tablescape HERE. 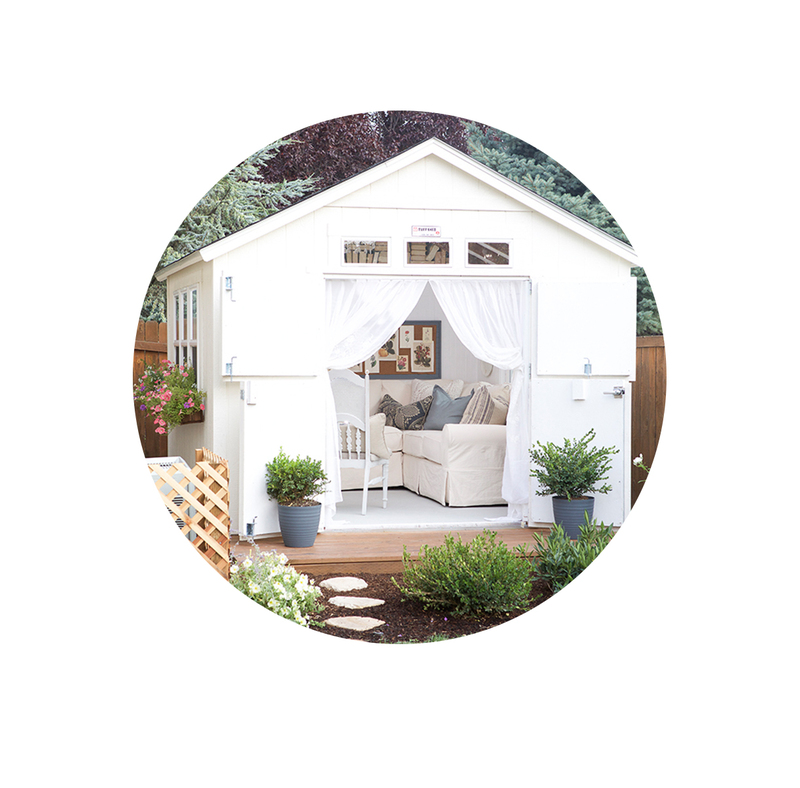 You can continue on with the tour tomorrow morning with gorgeous inspiration from Inspired by Charm. Michael always creates such inviting spaces and I know you will love his tour. I still have some really great projects to share in the coming weeks so I hope to see you back! Wishing you and your family the very warm and coziest holiday season full of love, memory making, and the true spirit of Christmas. I think your home is sooo pretty, one of my favourites for sure. I like all the white that you do, with touches of red for Christmas. Those new stockings are gorgeous, and I like how you hung them. It’s all so very beautiful and once again you have gorgeous table decor. Your home is so welcoming and I love your furniture and furniture placement. Your children are so lucky! ???? Your home looks beautiful!! 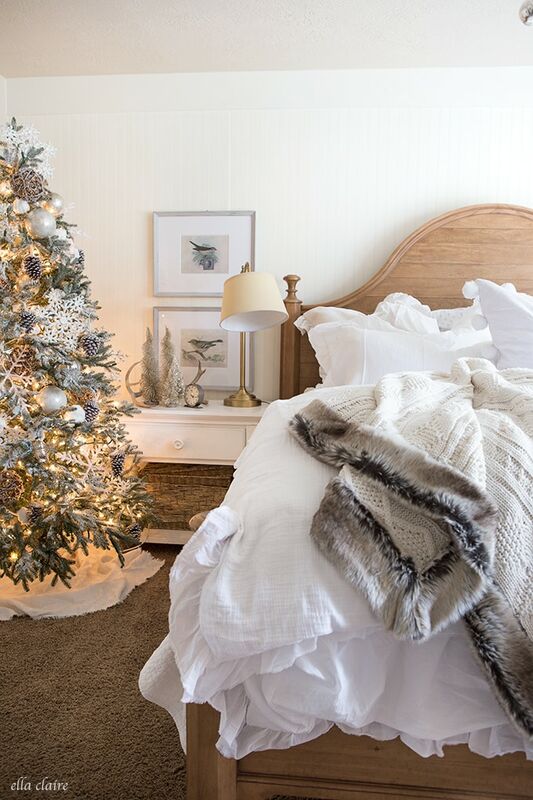 Your flocked tree is one of my favorites ever! Thank you so much for being a part of the housewalk!!! 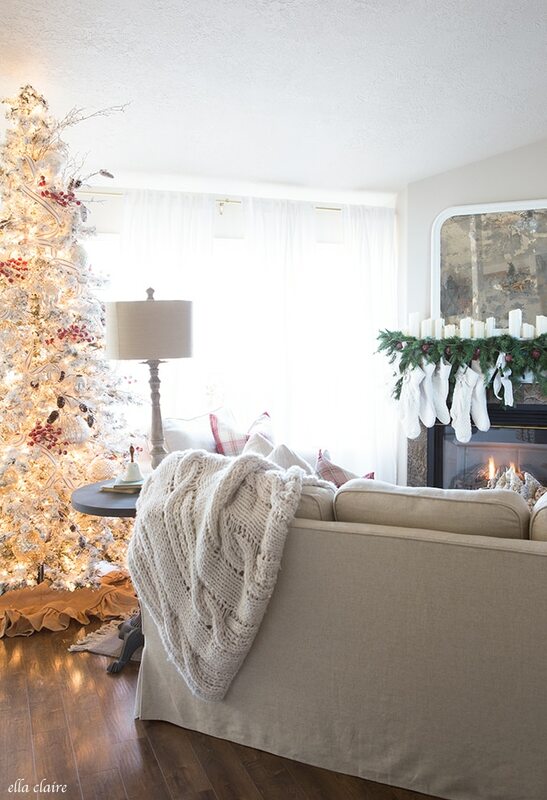 You have a lovely style, year round in your home. Very much YOU! 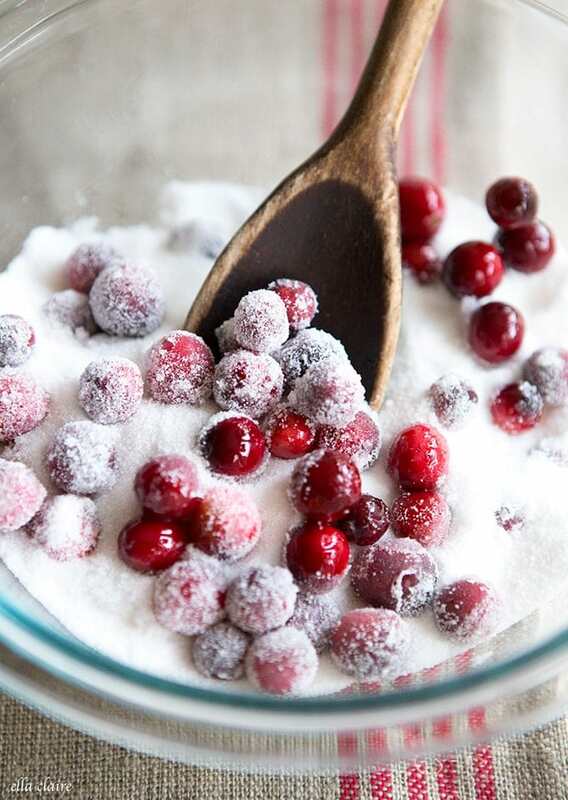 This is a wonderful part of your holiday decor. 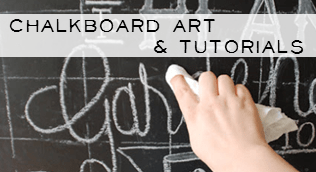 Everything is simply beautiful and also doable for your readers. Thank you and Christmas blessings you you and your family! Kristen I adore your home and the way you adorn it. The textures. I don’t know why but I always notice the soft, nubby, woven, fluffy, etc etc textures in your home. 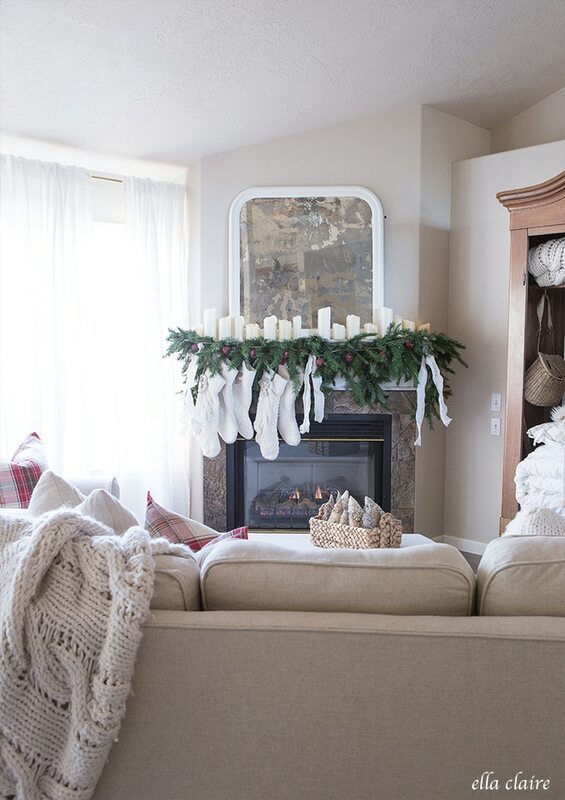 Love your mantel this way– my favorite!